With a lively rhyming text and vibrant paper collage illustrations, author-artist Bob Barner shakes the dust off the dinosaur bones found in museums and reminds us that they once belonged to living, breathing creatures. Filled with fun dinosaur facts (a T. Rex skull can weigh up to 750 pounds!) and an informational Dinometer, Dinosaur Bones is sure to make young dinosaur enthusiasts roar with delight. Bob Barner was born in Arkansas, grew up in the midwest and now lives in Northern California. He graduated from The Columbus College of Art and Design in Columbus, Ohio where he received a Bachelor of Fine Arts degree. He has worked as an art therapist and an art director at several advertising agencies and design studios and has also assisted Al Capp with the writing and drawing for the popular comic strip Li'l Abner. Barner works with pen and ink, watercolor, cut and torn paper as well as three dimensional materials. digs up another set of rattling fine specimens for this splashy expedition into the world of fossils. A simple poem ("Dinosaurs are gone for good./ Maybe dinosaurs once lived in your neighborhood!") serves as an umbrella framework for a lesson on prehistoric favorites. Each turn of the page pairs a single stanza in hand-lettered type ("Dinosaurs had teeth to bite and jaws to chew") with an accompanying illustration, while a bite-size piece of additional information in smaller type helps extend the book's appeal to older readers ("The shape of the jaws and teeth help scientists find out if a dinosaur was a meat or plant eater"). The snappy, vigorous rhymes ("They had bones with disks and bones with points,/ bones for running with sockets and joints") propel the production forward, while the artwork, a jazzy blend of pen-and-ink, watercolor, cut and torn paper and computer graphics, creates a tantalizing blend of streamlined shapes and saturated colors. 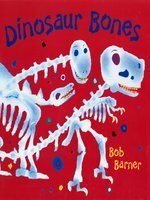 Barner shows each spotlighted dinosaur in both skeletal and living form, and two concluding spreads offer more information in a height chart and "dinometer" chart, fleshing out such questions as "What did it eat?" and "What does its footprint look like?" A splendid introduction to a perennially popular subject. Ages 2-8. Copyright 2001 School Library Journal, LLC Used with permission.